If you've enjoyed the miniatures I've been posting lately, but have felt too intimidated by the cost or difficulty, it's probably much easier and cheaper than you think. 1. Paints: Watch any painting tutorial and you'll likely see the painter using numerous paints AND still mixing paints to get the colors they need. A single pot of Games Workshop paint is as much as $7.50 and there's also the problem of the pot drying out before you've used much of it. I've been using the Army Painter paint set. 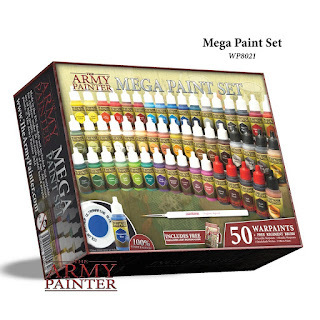 50 paints (including washes and metallics) and a brush for $99 (21% off at Amazon). I've been happy with the paints, plus they come in droppers instead of pots so they don't dry out as easily and you won't knock one over by accident. Wargamer Most Wanted Brush Set: Three brushes of various sizes for $13. Self-Healing Cutting Mat: I use this to paint on. $10.